Registration is at 0830 at the Renaissance Riverside Hotel in Saigon and transfer at 0900 to the Delta Port of My Tho by coach arriving at 1100 for check in followed by port and immigration formalities. My Tho is the hub of the Delta, but not of great cultural interest, so once on board we set sail at 1300 and have lunch. In the afternoon we moor near Cai Be and make a fascinating trip by traditional junk to explore evergreen islands and at the former Imperial residence, the An Kiet House. Surviving members of the Kiet family will welcome us with tea and we can wander in the fruit orchards around the house. Overnight moor mid-stream Cai Be. We take a morning junk trip around Cai Be to see a floating market, and go ashore to visit the French Gothic Cathedral and colourful port area, with its colonial buildings, delightful flower gardens and local rice paper manufacturers. We return to the ship and cruise over to Vinh Long to visit a Bonsai Garden and fruit farm, followed by visit to a brick and pottery factory. 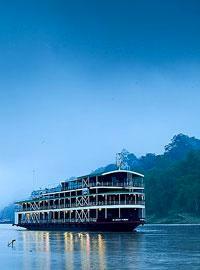 We return to the ship and cruise past Vinh Long City and evergreen islands. The remainder of the day is spent cruising through the Mekong Delta. The capital of Cambodia retains its French charm. The old colonial architecture makes an attractive backdrop to busy cafes, and the renovated river "corniche" is full of life. The city has several impressive wats, including Wat Ounalom, Wat Phnom and the newly-painted Wat Lang Ka. Pride of place goes to the spectacular Silver Pagoda, one of the few places in Cambodia where artefacts embodying the brilliance and richness of Khmer culture were preserved by the Khmer Rouge. The National Museum is another highlight, with outstanding displays of Khmer crafts. An afternoon excursion is arranged to the Killing Fields and the Khmer Rouge’s grim Tuol Sleng or S21 detention centre situated in the suburbs of the city. The great lake dominates Cambodia and is over 150 Km in length. Here bird life is profuse, and from the middle of the lake one cannot even see the shores. There is a great stillness and tranquility as we pass floating fishing villages. 1. High water, approximately August - November. Cross the Tonle Lake at dawn and 1000 disembark at Siem Reap Port for onward coach transfer to the KULEN II RESTAURANT in Siem Reap by 1100. For passengers staying at our partner hotel in Siem Reap the transfer to the Victoria Resort and Spa is included.